The Federal Transit Administration (FTA) launched a nationwide transit-oriented development (TOD) initiative to encourage development near transit systems that boosts the local economy; provides easy access to jobs and services; and creates compact, mixed-use, walkable communities. The initiative supports the Ladders of Opportunity Initiative of the President and the Secretary of Transportation. The National Public Transportation Transit-Oriented Development Technical Assistance Initiative focuses on supporting communities across the country. FTA has engaged Smart Growth America (SGA) to run the technical assistance and provide a variety of planning and analysis tools. Along with developing best practices and profiles of communities that have successfully implemented TOD, SGA will work on site with leaders in several communities to offer in-depth technical assistance tailored to local needs. 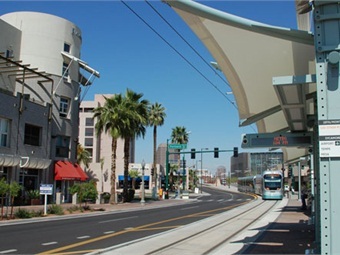 The free technical assistance, which will be offered through a competitive process, will include planning for and managing economic development near transit through effective zoning and land use as well as expert advice on preserving affordable housing and securing advantageous commercial development, among other challenges. Community leaders can apply for technical assistance at the project’s website. The site also will assemble the best information and tools to support TOD planning and deployment as well as create a network that will provide information on funding and training opportunities, on-demand research and analysis, and peer-to-peer meetings and mentoring on topics of shared concern. Community leaders interested in learning more about the new TOD technical assistance are invited to join SGA for a Dec. 10 webinar.